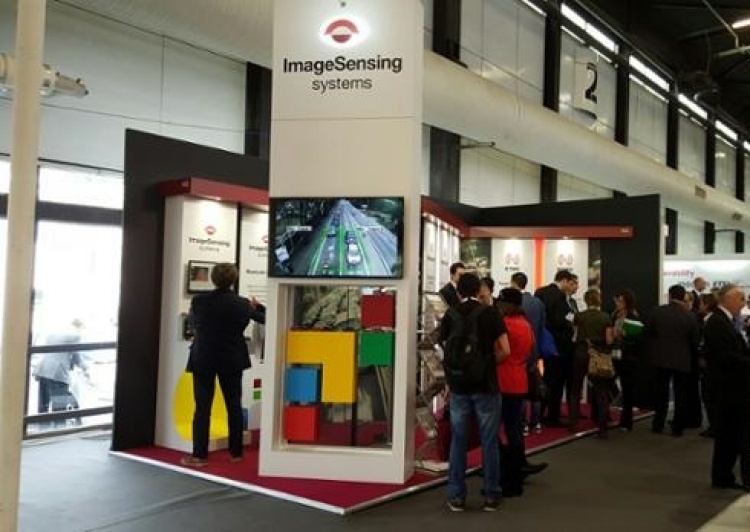 Image Sensing Systems (ISS) are having a busy week in Bordeaux at the ITS World Congress 2015 from the 5th-9th October. ISS is a provider of above ground detection and information management solutions for the Intelligent Transportation Systems (ITS) sector. You can visit them in Bordeaux on their brand new exhibition at stand number A12. We designed and built a new stand for ISS to showcase their impressive technology and extensive product range. The stand was custom made to include a large 4 metre tall tower, which housed a large flat screen monitor streaming various images. The stand walls were clad in large format graphics with ample space for company information, key messages and product displays. We have designed the stand to allow for significant modification so that ISS are free to alter the stand size and vary their displays and information depending on the different events. With numerous options for reconfiguration and plenty of built in storage the new exhibition stand is not only eye-catching, but is hugely practical and adaptable, ensuring a fantastic return on investment and years of use. To read the full case study about the new ISS custom exhibition stand please click here. Good luck to the ISS team at ITS World Congress from all at GH Display. We are wishing you a successful show.